Born in Dresden, Germany, Her Highness Princess Maja von Hohenzollern is internationally renowned for her devotion to bettering the lives of both humans and our animal co-inhabitants. As a TV host, entrepreneur, designer, author and humanitarian, Her Highness works tirelessly to help animals and to inform the public about the direct link between animal welfare, environmental protection and alleviating world hunger. She currently lives in Spain, has adopted 11 dogs and three cats from the streets and has saved the lives of hundreds of other animals. 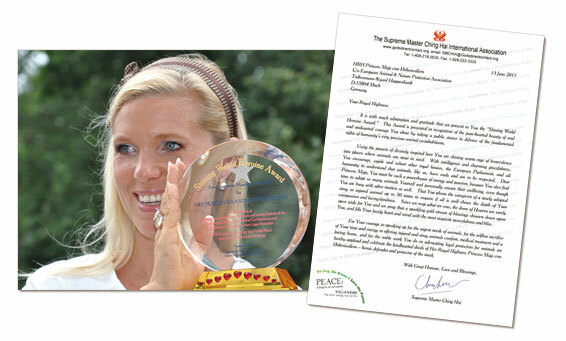 In 2009, Princess Maja received the European Animal Welfare Award. Out of respect and love for our fellow beings, Her Highness also observes a meat-free diet and is committed to spreading the word about the destructiveness of animal agriculture. As a gesture of compassion and in sympathy for their suffering, Princess Maja attends a mourning ceremony for all dogs that have died through the canine meat market. With an unbelievably large number of stray animals still being killed in Europe, Her Highness is calling on the European Union to ban the euthanizing of stray animals and to enact other animal-protection measures. As an ambassador for the European Animal and Nature Protection Association (ETN), She campaigned vigorously for closure of the animal-killing station, ‘Stupini’ in Romania on September 2011, and thus saved 600 dogs. In a special message to Master, Princess Maja said, “We both are part of a network, in which we raise our voices together, our voices for animals, our voice for a life of dignity, for respect, for life, for the interaction of people with each other.” The Princess also mentioned that she feels close to Master and regards Her as a soulmate, because they share many things in common such as artistic creativity and a love of animals. “I look forward to our meeting each other someday. I am sure that will happen. No matter where, let me know,” she added. We applaud and celebrate the kindhearted deeds of Her Royal Highness Princess Maja von Hohenzollern, a defender and protector of the meek and helpless. We also extend our sincere respect and thanks to her for her steadfast commitment to safeguarding and bettering the lives of our beautiful animal co-inhabitants.